CBS had a terrific start to the NCAA Men’s Basketball tournament with its two late games Thursday, right around 5.5 million viewers ages 2+. These audience levels are among the best ratings for this day in recent years: the 7:00 pm game on CBS (#8-Cincinnati beating #9-Purdue 66-65 in OT in telecast 7 of the tournament) averaged 5,514,000 viewers and the 10:07 pm nightcap (#1-Kentucky pushing #16-Hampton aside 79-56 in telecast 8 of the tournament) averaged 5,460,000 viewers, a great number for a blowout. Clearly, a lot of momentum building for Kentucky, the favorite to go all the way. The ratings for the other two CBS games earlier in the day Thursday (telecasts 5 and 6) are not available. Only prime time ratings for broadcast networks are available the next day, another peculiar Nielsen habit. 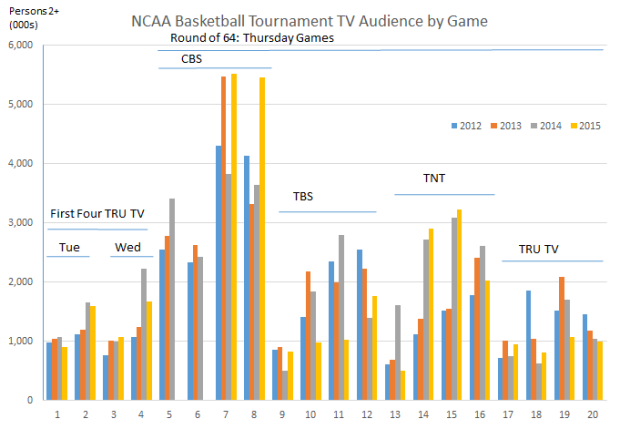 Cable networks on the other hand, get ratings for all dayparts the next day, and the four games on TBS, TNT and TRU TV were each very much in line with previous years. But given the strong CBS start, interest seems very strong in the early going.